We encourage you to read the posts below and stop by once a week for an update, and then decide if YOU want to help us right some wrongs for your colleagues and make learning in China more fun and creative for the students. Einstein once remarked that "Imagination is More Important than Knowledge" but we think both are needed in China to provide a quality education that become a good memory and practical foundation for our students. We also believe that how a student thinks is more important than what they think. When you meet a few dozen Chinese students, you will quickly understand WHY we feel this way. As you can see from our mission statement, we are equally concerned and pro-active in protecting the interests of every foreign teacher in China - both veterans and newcomers alike. 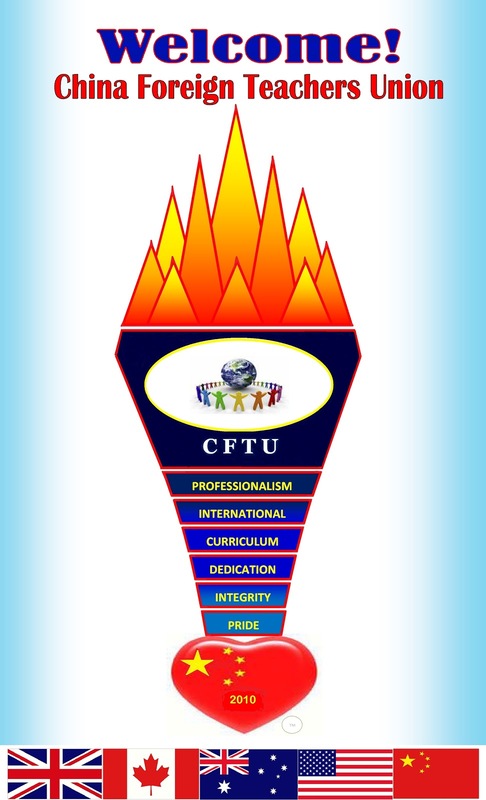 As a member of the CFTU, you will receive a number of great benefits and the collective support of veteran teachers who have worked in China 5-15 years and know the ropes, and the people in education circles here. We will officially be resuming our membership drive in January, but hopefully you will spend the next month making notes of all the great ideas you want to share with us as our newest member. Reading the posts here will answer 90% of your questions, and when you visit with one of our reps in person or by Skype, we can answer any other questions you may have. I have heard my fair share of horror stories about teachers dealing with agents in China. Every teacher has his/her own experience they would rather forget. Its not the experienced professionals that get taken advantage of. Instead its the newbies that have their asses handed to them by people who are more than willing to make windfall profits off the ignorance of eager young teachers. Explanation: Many of you may wonder why we chose this "unusual" way to post our web site on the internet and the answer is three-fold: Blogger is hosted by Google which has the most secure servers on our planet considering their ongoing dispute with big brother in China. When we had our web site hosted on a private server, we were constantly under hack attack. So the primary reason is security. Secondly, we wanted an interactive interface where visitors could leave their comments,ideas, and suggestions right on the web site - even anonymously if they choose. We also want to leave the door open for public argument and invite rebuttals from adversaries so we are not accused of being biased, or even racist. Lastly, it is quicker and more economically for us to update information in this format without hiring a full time webmaster (remember nobody here draws a salary at this time - we are all volunteers so cost was a major concern as well). And now that we have your attention, we invite you to join in with your comments, observations, ideas, suggestions and constructive criticism. Whatever you post on our webs site, it must be in English, must be civil, and professional even when you trash an unfair employer. If your profanity is excessive you will remarks will be deleted. Ditto for someone posting a sales pitch or a link to sell something to our members.